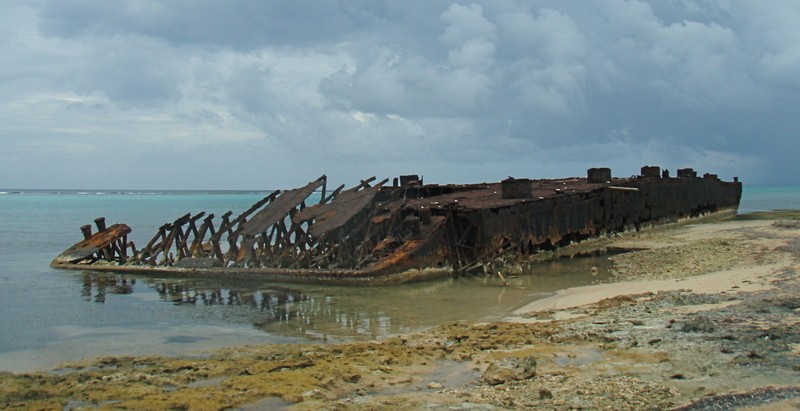 The remains of Blacktip Island’s supply barge rests on shore of the Caribbean island. Blacktip Island’s Pirate Festival celebrations turned ugly Wednesday when festival-goers accidentally burned the island’s only supply barge. No one was injured in the blast. The Tiperon Heritage Society, sponsors of the Pirate Festival, has mobilized a grassroots provisioning effort and is using the accident as a teaching opportunity. “We’re demonstrating all the old crafts we used back before there was a supply barge,” Heritage Society president Doris Blenny said. “We’ve transformed the area around the wreckage into a hands-on teaching exhibit, showing folks how to braid rope, weave cloth and hijack passing ships. “The Tiperons, and Blacktip in particular, have a rich history of piracy. We’re simply shifting the Festival’s emphasis from pretend-piracy to real-life piracy. This isn’t some ‘Captain Philips’ Hollywood show. No, no. This is authentic, parrot-on-your-shoulder stuff. “We got the Youth Scouts involved,” Scout leader Samson Post said. “They’re fearless in their little sailboats. And with their cutlasses. They can get right up close to a supply ship without anyone getting too worried – they’re just kids dressed up like pirates, after all. In related news, officials are asking for volunteer scuba divers to help recover any undamaged goods from the barge that may have sunk due to the explosion.